Reprinted by arrangement with Avery Books, a member of Penguin Group (USA) LLC, A Penguin Random House Company. Copyright © Virpi Mikkonen and Tuulia Talvio, 2016. 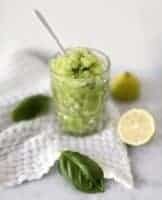 Combine the cucumbers, apple slices, lime juice, and basil in a blender. Blend until the mixture is a smooth slush. Add sweetener, if desired. Serve and enjoy! Note! You can also make the slush from non-frozen cucumber and apples by blending all the ingredients in a blender and then running the mixture in an ice cream maker for about 15 minutes.